The official weigh-ins for “UFC 136: Edgar vs. Maynard III” takes place today inside the Toyota Center in Houston, Texas. The first fighter is scheduled to hit the scales at approximately 5PM ET/2PM PT. Saturday’s show features a pair of title bouts. 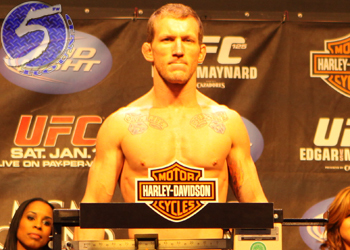 Gray Maynard (Pictured) will challenge lightweight champ Frankie Edgar for his crown in the night’s featured attraction, while Jose Aldo will defend his throne against Kenny Florian in the co-main event. A middleweight shootout between Chael Sonnen and Brian Stann will also appear in the show.